So beautiful and outstanding, this luxury paper tube packaging box, with UV printed bronzing logo, is of no doubt a good choice as package for you high-end gift, wines or other luxury products. First, let’s take a look at its materials, made of 350g SBS and golden cardboard, with decoration of 128g double chrome paper, the base of this package box expresses the conclusion that good quality firstly comes from good materials. In addition to all of these, this packaging box applies multiple technics: UV printing, embossing printing and hot gold stamping as to express and activate the most refined sensation of beauty. The design uses patterns of diamond forms, good for esthetic needs but also implies the luxury positioning of the product inside. 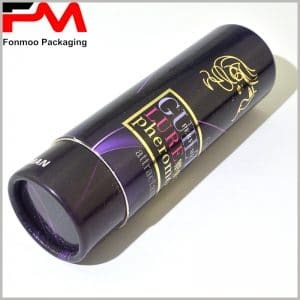 If you find this tube packaging box suits your demands, do not hesitate to contact us to provide us more details of your demand, we will give all our efforts to bring you the best luxury cardboard tube packaging box with golden hot stamped logo you need.